Paula’s book includes recipes from all round the Mediterranean (I’m trying out some of the Turkish dishes). 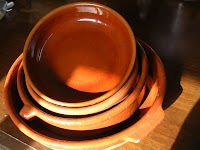 She gives a good description of various types of earthenware pots, crocks, casseroles, daubières, cazuelas and tagines. Cazuelas are Spain’s contribution to clay pot cooking. They are wide, flat casseroles of low-fired clay, glazed on the inside, so liquids don’t escape through the porous clay, and unglazed on the bottom. Cazuelas come in many sizes, though they generally are not very deep. Rarely do they come with lids. I use my cazuelas directly on a gas stove burner. I don’t have any experience with electric or ceramic cooktops, so I suggest you follow Paula’s advice and always use a heat diffuser when cooking in earthenware on these types of stovetops. You can use a cazuela in place of a skillet, a paella pan (a paella becomes “rice cazuela”), a sauté pan, an oven casserole. Earthenware holds a slow, steady heat, allowing foods to cook gently and evenly. Earthenware holds the heat, so food continues to cook even after you remove it from the stove. You can even sauté and brown foods in a cazuela—add enough oil to cover the bottom surface and heat the oil until very hot. Don’t crowd the pan with the foods to be browned. New cazuelas taste of raw clay. Soak them in water for 24 hours. Dry well, then coat the inside with olive oil and place in a medium-low oven for 40 minutes. Frequent use is the best method for seasoning cazuelas. Never heat an empty cazuela. Take care not to set a hot one down on a cold surface, as it might crack. Really big cazuelas are heavy and not easy to manoeuvre in and out of the oven. Small cazuelitas are fine for microwave cooking and reheating. Here in Spain, cazuela is both the name of the cooking vessel and of foods cooked in it. Most cazuela dishes start with a sauté, or sofrito, and finish braising with liquid. 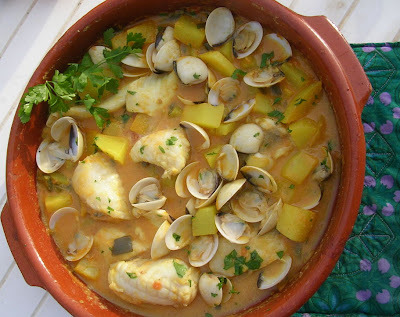 My recipe for monkfish, clams and potatoes in almond sauce is a good example of cazuela cookery. The almonds both flavor and thicken the sauce. Monkfish is a sweet-fleshed, toothsome fish, easy to fillet, as it has no small bones. 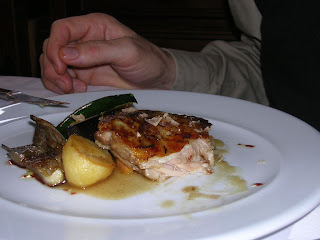 If you can get the whole fish, use the head to prepare a simple fish stock, which will add flavor to the finished dish. 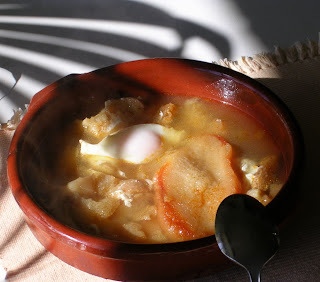 I cooked this recipe (as pictured below) in a 30-cm/ 12-in cazuela. Heat the oil in an earthenware cazuela. Fry the bread, garlic and almonds until golden. Skim out. Add the green pepper and onion to the cazuela and cook on medium heat until onion is softened, 10 minutes. Add the tomato and continue frying. Add the potatoes. 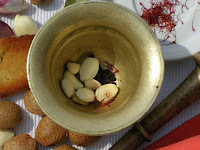 Combine the bread, garlic, almonds, wine, saffron and pimentón in a blender (or crush in a mortar). Blend to make a smooth sauce. Pour the sauce over the potatoes. Add salt and fish stock. Cook on a medium heat, stirring occasionally, until potatoes are tender, about 20 minutes. Add more stock or water if necessary to keep the sauce from scorching. Turn up the heat and add the chunks of monkfish and clams. Cook, stirring occasionally, until fish is cooked and the clam shells open, about 10 minutes. Sprinkle with chopped parsley and serve. A few miles outside the village where I live is a small shrine in the countryside dedicated to San Antón Abad, St. Anthony Abbot, the patron saint of pigs and other farm animals. 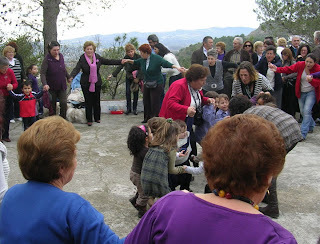 January 17 is San Anton´s festival day. When the weather is fine (and often it is brilliant winter sunshine), the locals make a day’s outing to the shrine, to attend a late morning mass. In bygone times it was an occasion for the blessing of farm stock. 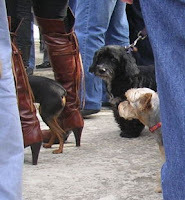 Now, people bring their household pets to receive the priest’s benediction. 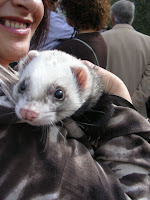 Horses and ponies, giant mastiffs and wee chihuahuas, cats, rabbits, birds, turtles, a ferret. Nevertheless, it is really the day of the pig. St. Anton is usually depicted with a pig at his heels and he is said to be the pig’s protector. However, the occasion falls in the coldest time of the year, traditional season for the matanza, or hog butchering. It is also one of the last festivals before the beginning of Lent, when “pigging out” will be forbidden. 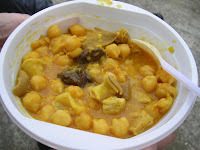 The ladies of the San Antón society cook up huge vats of traditional potaje de callos de San Antón, a stew with chickpeas, sausages and all the parts of the pig—tripe, ears, ribs, trotters, tail and fatback. This is real stick-to-your-ribs fare. Requires some lively folk dancing to work off the caloric input! The small image of San Antón inside the chapel now has a protective glass screen. That’s because of a long-standing local tradition, which says if an unmarried girl manages to hit the saint’s image with a pebble, she will find a novio, a suitor, before the year is out. Today, the women aim their missles at an image of San Antón outside the shrine. This version of tripe stew is made with pork rather than veal tripe. I have omitted the ear, trotter and tail from this recipe. Should you be starting from scratch, scrub the tripe with salt and vinegar, blanch it in boiling water, then cook in fresh water for 1 hour. If using trotter, remove bones. Cut tripe, ear, tail, trotter into small pieces. The recipe calls for roasted garlic. To roast a whole head of garlic: Spear the head of garlic on a fork or grasp it with tongs and hold over a gas flame (or put under the broiler), turning, until it is charred. Peel the garlic cloves, rinse in running water and add them to the stew. Drain the soaked chickpeas and put in a deep pot with fresh water to cover. Bring to a boil and skim off froth. Add the pieces of cooked tripe, pancetta, roasted garlic, bay leaves, parsley, chili, onion and tomato. Bring again to a boil. Cover and simmer for 1 hour. Combine the pepper, cloves, pimentón, saffron, salt, cumin and crushed garlic. Dissolve in some of the liquid from the pot. Stir the spices into the pot. Cook slowly 1 hour more. If necessary, add additional boiling water. 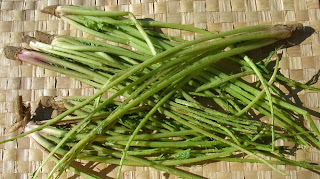 Tagarninas are stems of wild thistle. Today at the village market I found big bunches of tagarninas, the tender stems of a wild thistle that makes its appearance in frosty January. Related to the artichoke, this thistle (Scolymus hispanicus) is foraged in upland areas of Andalusia and Extremadura. 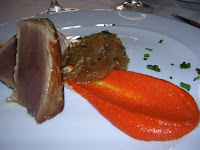 I first tasted it in Extremadura, where it was cooked in a delicate vegetable flan. But, country folk who gather it usually fold the chopped stems into scrambled eggs. So that’s what I had for lunch today. My first encounter with tagarninas in the wild was in the hills around the mountain town of Ronda, where I had gone to interview a goatherd. The goatherd showed me the plants growing. The first leaves appear after winter rains, forming a flat rosette about two feet across. Later in the summer the plant sends up tall stalks on which bloom yellow flowers. My guide pulled the whole plant up by the roots and, with bare hands, stripped off the prickly leaves, leaving the slender stems. These are chopped and blanched before cooking with eggs in a revuelto, a soft scramble. Here’s how. Cut away the root ends and chop the stems. (Twelve ounces of tagarninas will make about 2 ½ cups chopped greens, serving two.) Blanch them in boiling, salted water for 5 minutes. Drain well. Heat 2 tablespoons of olive oil in a skillet. Add 2 cloves sliced garlic, ¼ cup chopped serrano ham, a pinch of red pepper flakes and the greens. Sauté on medium heat for 4 minutes. Break 4 eggs into the skillet. Let them set for 1 minute. Use a wooden spatula to push the egg whites around and combine with the vegetable and ham. 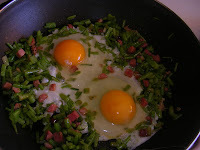 Then, gently, turn the yolks over, letting them break up and mix with the greens. Turn the eggs and greens out onto heated plates before the yolks are completely set. Add salt and pepper to taste. Serve with toast “buttered” with olive oil. You could substitute skinny green asparagus for the tagarninas in this recipe. You won’t need to blanch asparagus more than a minute. But should your foraging turn up wild thistles, by all means try them. 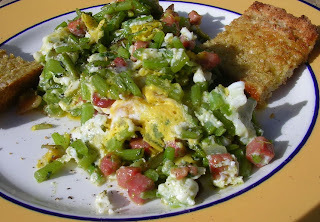 Wild greens scrambled with eggs and ham.